It takes some digging, but what is found is that Dupuy was an able trial lawyer who could not hold onto the post he fortuitously acquired because he was a Democrat who ran for election in a year that belonged to the GOP. If you’ve been following this series, you might recall that the Democratic nomination for Los Angeles County offices at one time virtually assured victory, even after the Republican Party had sufficient strength nationally to gain election of presidential nominees. But now, the Democratic Party here—then referred to as “The Democracy”—was no longer in a domineering position; Los Angeles County, like the state, now had two solid parties which took turns at garnering the public’s favor. And when Dupuy ran in 1888, partisan politics was, as never before, a major factor in the race for district attorney. But let’s back up, and see who Dupuy was. On Aug. 2, 1831, he was born in Kentucky. The 1870 and 1880 censuses show he was a lawyer in Kentucky living with his wife and three children. A book reciting the history of the Dupuys indicates that the subject of our inquiry graduated from the Law School of Lexington, Ky. in June, 1857; practiced in St. Joseph, Mo., then in Shelbyville, Ky.; was elected in 1862 as prosecuting attorney for Kentucky’s Fifth Judicial Circuit, moving to Louisville; served as a member of the Louisville City Council for two years; and was elected as a judge of the Louisville City Court in 1878. The incident occurred at the corner of Spring Street (now differently configured) and Market Street (long non-existent). The spot is presently within the confines of the Clara Shortridge Foltz Criminal Courts Building. The testimony of a witness, Anson Brunson, who had just resigned as a judge of the Superior Court, was that Bell struck his accoster, Gen. E. Bouton, on one of his arms with his cane, and that the jolt caused the bamboo scabbard to fall to the ground. The defense lawyer—one ‘Big Bill’ Williams, as denominated in the news story—argued that there was a lack of evidence of an intent to use a deadly weapon. The judge agreed, declining to bind Bell over for trial. Patton resigned on April 4, 1887, after only three-and-a-half months in office. Although his was the shortest term of any man elected as DA, he does not compete with Dupuy for the distinction of being the most obscure. 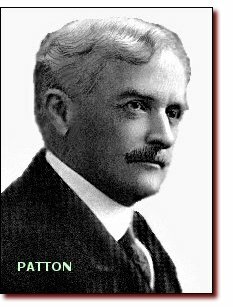 Aside from frequent references to him in biographies of his son, the elder Patton attained prominence as the first mayor of San Marino, the first city attorney of Pasadena, and an unsuccessful but outspoken candidate for the House of Representatives and the U.S. Senate. He was an adamant foe of extending the vote to women. Yesterday afternoon George S. Patton Esq. presented to the Board of Supervisors his resignation as District Attorney. Mr. Patton is not very robust, and during the campaign last fall he was ill for a considerable period. As was anticipated by his friends, the duties of the District Attorney’s office proved too onerous for him, and acting under the advice of his physicians he resigned his office. Of course the supervisors accepted the resignation. A largely signed petition was presented in behalf of J. R. Dupuy, Esq., who has been Assistant District Attorney since the commencement of Mr. Patton’s term, and Mr. Dupuy was readily appointed by the Board…. Mr. Dupuy, who has been appointed in the stead of Mr. Patton, is a gentleman of high legal attainments, and whose standing at the bar of Los Angeles is enviable. The Supervisors had the best interests of the county at heart when Mr. Dupuy was appointed.Politics did not enter into this appointment at all, but it is gratifying to note that Mr. Dupuy is a straightforward, consistent Democrat. The Herald, as you might have inferred, was the city’s Democratic newspaper. The staunchly Republican Los Angeles Times had no such words of praise for Dupuy. By the way, the petition urging the appointment of Dupuy which the Herald’s article says was “largely signed” contained the signatures of 32 persons, according to the Times. It is unlikely that Dupuy would have been hired by Patton had he not been a Democrat. While the office is, today, a nonpartisan one, such was not so then. A district attorney was chosen for a two-year term in a partisan election, and was not apt to bestow favors on members of opposition parties. Patton (a nephew and law partner of the Los Angeles Bar Assn.’s first president, Andrew Glassell) had run as a Democrat in 1886, defeating incumbent George Holton, the county’s first Republican district attorney. There were 5,509 votes for Patton, 5,265 for Holton, and 680 for J.H. Blanchard, the Prohibitionist candidate. Patton won in a Democratic year; Washington Bartlett, a Democrat, was elected governor (the only Jew, so far, to attain that post in California from its founding up to the present). 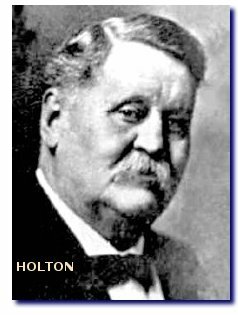 Ironically, the Democrat whom Holton beat in 1884 was Patton’s brother-in-law, Thomas B. Brown, the 1880-83 district attorney. Holton captured 5,188 votes, Brown got 4,798, and Bell, a member of the Greenback Party landed 544, with a Prohibitionist, F.X. Palmer, gaining 273. So partisan were these elections that an Oct. 28, 1886 report in the Los Angeles Times of a campaign speech by Holton reflects boasting by him of achievements and fiscal responsibility of the Republican Board of Supervisors, with no mention of anything he had done as district attorney. In those days, the district attorney of Los Angeles County did personally prosecute cases…as Hamilton Burger did, as late as the 1960s, on the Perry Mason TV show. The DA’s personal courtroom chores included even relatively mundane matters. An Oct. 16, 1888, item in the Times recites Dupuy’s stance on a bail motion at an arraignment. Though it appeared that the nomination of Dupuy was said and done, one delegate, J.B. Holloway, protested the lack of fair play in the shutting down of nominations and proposing a different candidate, Glowner. There was a to do about reopening nominations, but Glowner came forth and withdrew in favor of Dupuy. The tally was 13,283 votes for Kelly, 10,653 for Dupuy, and 1,278 for Blanchard. Dupuy did not join the ranks of the unemployed when the term to which he had succeeded expired in January, 1889. In 1888, he had gone into law partnership with Edward H. Bentley, with whom he had previously been associated; Dupuy & Bentley maintained a law office at 204 West Pico. There was no legal impediment then to DAs maintaining a law practice on the side. Right on the heels of losing the DA’s race, Dupuy eyed the office of Los Angeles city attorney. As it turned out, neither Dupuy nor Glowner was nominated; Lewis got the nod without opposition. Whatever happened behind the scenes is not known. 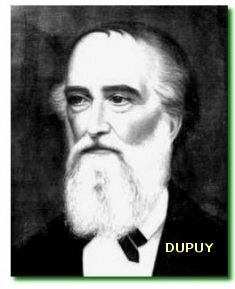 After Henry C. Dillon, a Democrat, gained office as district attorney in 1893, he hired Dupuy as a deputy. The next district attorney was John Donnell, a Republican, who tapped Holton as his chief deputy.